Associated Builders and Contractors (ABC) Michiana Council had a presentation from Mike Pence to discuss how his goals, if he becomes governor, would align with the free enterprise goals of ABC. He related several personal anecdotes on why he believes that Right-to-Work should be one of the number one goals of his administration. He expressed his belief that on many of our issues, it was a matter of educating the public. His opinion is that educating the public on issues should be one of the governor’s priorities. He spoke elequently and made a strong case for ABC’s support of his candidancy. There appears to be only one other candidate at this time, but there may be more. 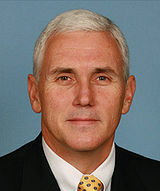 If others decide to try their hand against Mr. Pence in the primary, they will find a formidable opponent. I think it’s likely that he will be the Republican candidate for governor.